C21 Creative Communications » Not just bright, Brilliant » What’s your ‘WHY’? I recently watched Simon Sinek’s 2009 Ted Talk on ‘How great leaders inspire action’ and thought, how a decade later, this video may be more relevant now than ever. With trust inequality at a record high, the fragility of systems such as the government, the media and NGO’s has been laid bare. As this year’s Edelman Report outlined, 2018 has done little to stem the widespread uncertainty and as a result, people are now turning to their employer and to brands, for a trusted relationship. Social good is no longer a virtue claimed by individuals with a penchant for giving back. The rise of an empowered consumer means an expectation for their goods and services to come from a socially conscious supplier, one who operates ethically, though values and has a bigger picture vision to promote positive change. 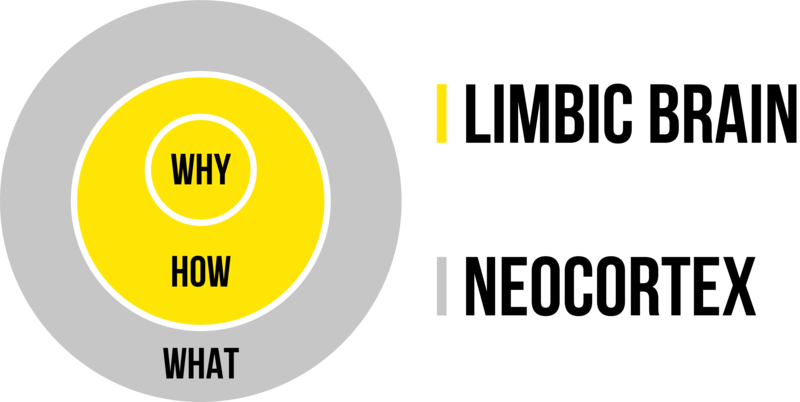 Sinek’s ‘Golden Circle’ is a useful tool to help brands and business explore their positioning in this new unchartered territory. The circle establishes (1) WHAT it is a company does –their product or service or bread and butter offering. It also establishes (2) HOW they do it – what defining qualities their company brings to the table to differentiate themselves from their competitors and set their products or service apart. Finally, the circle asks 3) WHY they do it – what’s the vision, the driving force, the reason they get out of bed in the morning. A simple vision for companies to make money is no longer going to cut the mustard. The majority of companies, although communicating on these three levels – tend to do so from the outside in. They market what they offer and how they are better and expect a behavioural change at the end. Simple. However, this isn’t the recipe for long-term success- at least we don’t think it is. And we know this due to the golden circle being intrinsically linked to the biological structure of our brain. ‘WHAT’ is the same as the outer cortex of the brain – our Neocortex. This part of the brain is responsible for our analytical and rational thoughts and most importantly language. This is where we digest and communicate information. ‘HOW’ and ‘WHY’ correspond to the middle section of our brain; our limbic system. This system is directly responsible for our behavioural and emotional responses. Unlike the neocortex, there’s no capacity for language processing. However, this is where information or feelings resonate with us and where our response as a reaction to this, is cultivated. This is why, when an organisation bombards a consumer with ‘WHAT’ they do rather than ‘HOW’ or ‘WHY’ they do it – we tend to comprehend the information, but it doesn’t elicit a change in our behaviour. The more successful businesses and brands work with their why, influencing an emotional alignment between their consumers and their bigger picture purpose. ‘People don’t buy what you do; they buy why you do it,’ Sinek repeats throughout the talk. The most successful companies will be the ones who take heed of this message.